Mattify and correct your complexion with the DHC Pore Collection, a go-to skin care range to target and transform visible pores. Powered by Naomicelle technology, the range works to visibly diminish the appearance of large pores whilst nourishing your skin with beneficial botanicals. As well as supporting your skin’s natural moisture barrier, this alcohol-free range contains anti-aging antioxidants to delay the skin’s gaining process whilst nourishing your skin with multi-vitamins. 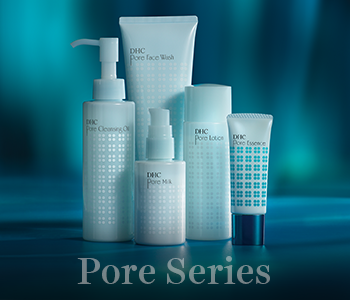 Perfect your pores with the unique delivery system of the DHC Pore collection.